MarketGoo takes a look at the types of content on your website plus the frequency with which you make updates, and offers recommendations that will make your site more interesting — both to visitors and search engines. But wait..why is content important for SEO? Don’t worry if you’re new to all this, we developed MarketGoo for users just like you. This is how content can help SEO: visitors land on your site, get all the answers they need through your content, continue to find a lot of related, useful information and stay on your site. Your content helps SEO if it’s centered around what your audience is looking for. The more content you have which can answer their questions will help Google understand that you’re a credible source of information. You must try to cover most of the potential questions and topics within your niche (breadth), but you’ll need to go in-depth into each topic, ideally linking to your own content, but also linking to other resources when necessary. 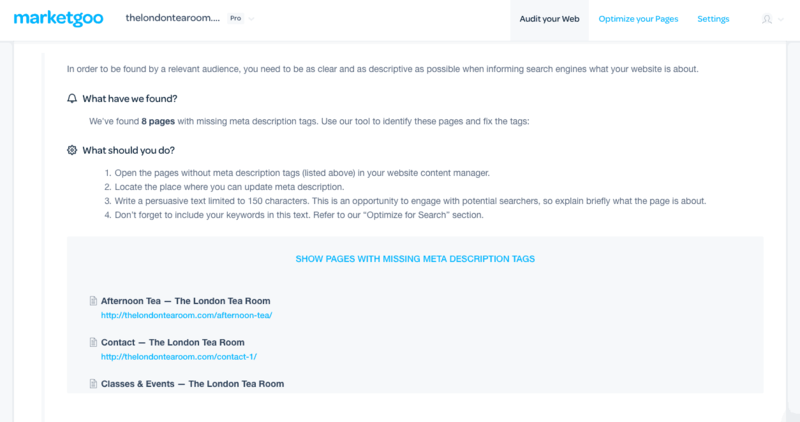 In this area of the tool you will focus on tasks that are critical to your site’s optimization. We look for a good user experience on your site, and make sure that search engines notice that your site seems built for people and not search engines. Content is a main pillar of your site, and even if you have an incredible and attractive design, this alone won’t convince search engines or users that you are what they are looking for, or better than your competitors. You have to show it, and the best way is through helpful, relevant and well-written content. If you have very little visible content compared to the amount of code, or don’t have a blog, it is harder for the search engine to recognize it as a useful or credible site. We stress to our users that they create content that makes sense and doesn’t just pile on keywords; we offer guidelines and recommendations in order to craft the best possible content. Likewise, it is important that commit to creating new content consistently; this is one of the more work-intensive areas, and as such it will also have a very high impact on your site’s rankings. It is important that our users understand that there is a difference between consistent content generation and frequent content generation. While it is great if a site is pumping out a ton of high quality content, it is important that this be part of a larger strategy – this means sticking to the strategy and content schedule you’ve laid out. If one week you publish every day, and then don’t create any new content for a month, there is a problem. We will help you create and stick to a content schedule. Creating at least one piece of quality content per week is a winning strategy for your SEO.